When I opened the package, I thought, “well these are ugly.” Then I picked them up and stuck my hand inside and thought “wow, this is nice.” I then called my mother and said “you are not allowed to steal them!” If you’re wondering what on Earth I’m talking about, it’s socks. 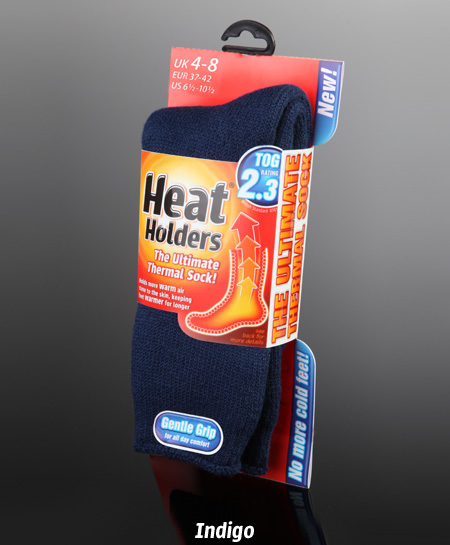 Sometime this summer, I was contacted about trying out a pair of socks called Heat Holders. I’ve never been asked to try & review a product before, so I was really excited and also thinking “you know it’s summer right?” I said I wouldn’t feel comfortable writing a post until I had a chance to wear them in really cold weather. This weekend I finally had that chance. I was working on the ski house with my parents, and it was ~10-15 degrees outside. We were inside, but it was still cold. I was holding the ladder while my father worked on getting the insulation in the ceiling. Do you know what holding a ladder means? It means you’re standing still not really moving or doing anything to keep warm. I had to take a break to go warm up in the basement (the basement has heat). As I was walking down the stairs I realized that my feet were not cold. I then thought, “MY FEET AREN’T COLD!” I went the whole day without ever having to think about my feet. I did, because it was a weird feeling to have the rest of my body cold and not my feet, but I didn’t HAVE to think about them. It was awesome. I can’t wait for a big snow storm to test them out again! The only thing I’m disappointed about is the fact that they are so thick, I won’t be able to wear them with my ski boots. Considering I love all sorts of snow activities though, I know that these will get plenty of use. You know what is even better? You have a chance to win a pair! Leave me a comment about what winter activity (or not-activity) you’d love to have these for, and give Heat Holders a like on Facebook and a follow on Twitter and you could win a pair. I will be going old-school style and picking a name out of a hat to find the winner. (I tried to be fancy, but I just couldn’t get it to work. You have until Tuesday, 12/10 at 6PM to enter. I will announce the winner on Wednesday morning! *I was contacted by Heat Holders through email, who sent me these socks so that I could write a review. I have not received any compensation, but these socks are mine! Also, all thoughts are my own. I’m going skiing for New Years and these would be perfect. When hiking last week my feet were freezing and these would be great to have!